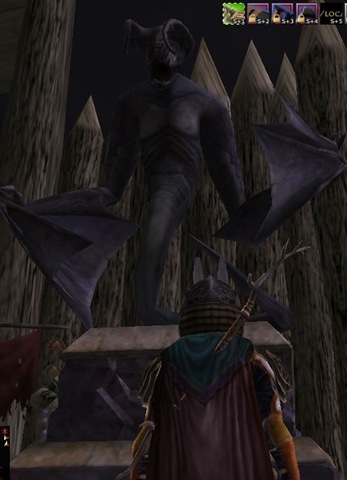 Jumped into Lord of the Rings Online during daylight hours today to get some more questing in Angmar done, as well as to take advantage of the +25% XP enabled for the current Welcome Back Week event (Fall Festival is running now too folks!). A darn dread statue! Not a very powerful one, it only added 20 Doom/Dread/whatever to me – but the only mitigation I had on hand was my Horn of the Dwarrowdelf that added 10 radiance. As a solo hunter anything that lowers my Morale and regen rates is a bad thing. ~ by Branadoc on October 15, 2009.